When we found out we were having baby number 3 I knew that Parks (4) and Lux (2) would have to share a room soon. I was kind of excited for them to! My sister and I shared a room when we were little and I LOVED it. I think they are at a perfect age to grow a friendship and bond. We live in a 4 bedroom house with a master, nursery, lash/guest room and now the "Boys" room/playroom. Knowing that this would have to be a playroom as well I knew I needed as much storage as possible in order to fit all toys, and make it comfortable for them to play and sleep. 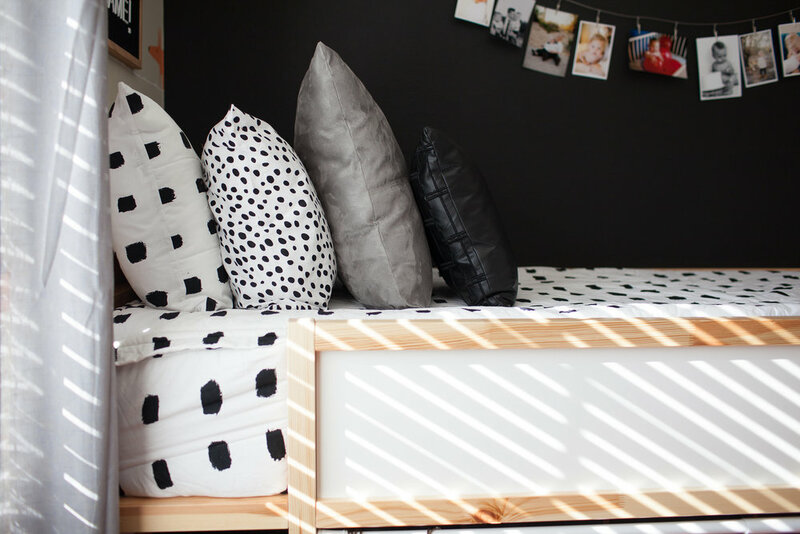 This is how I came up with the IKEA Kura bed. 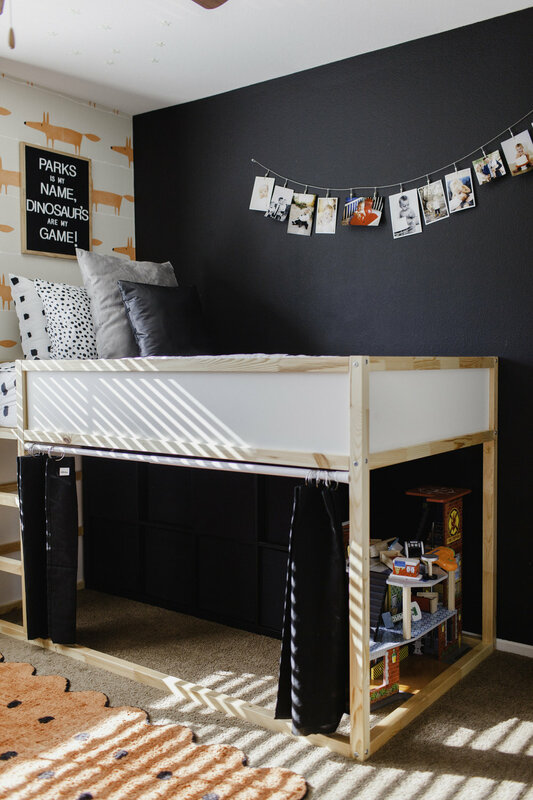 Perfect for a little boy, but great for storage underneath! We bought two of these, as well as two 8 bin Kallax storage units from IKEA. We miraculously fit all toys in bins with the exception of a couple larger toys on the outside. I have to tell you how much more my boys enjoy going into their room now, they know where everything is and it is so much more easy to clean up! I searched high and low to find a wallpaper I loved, do you know how many wallpaper companies there are?!?! I came across this Mr. Fox wallpaper from Wallpaper Direct. 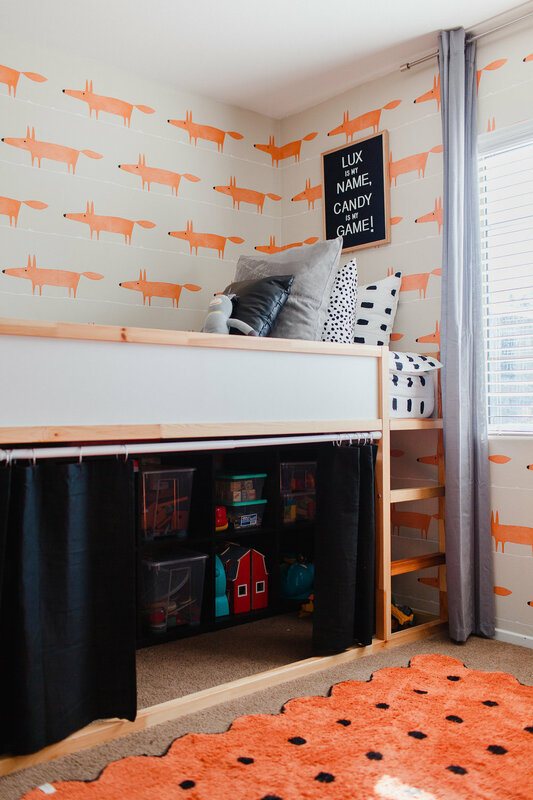 I loved the orange and the simple fox decal. Once I found the wallpaper it was much easier to work around this. The bedspreads are from Beddy's and I am obsessed, one zip and the bed is made! Not to mention I think they complemented the look I was going for perfectly! I chose the Dash pattern and was so happy with it. 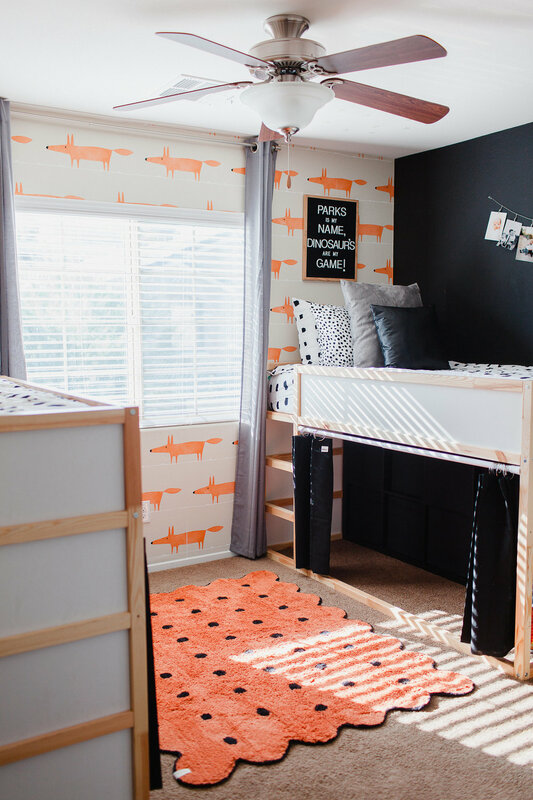 We also worked with Leesa mattress to get the boys two new twin mattress's for the boys. In the words or Parks "This is the softest bed I have ever slept on!" Finding wall art for little boys is hard, everything either seemed too feminine or not the right vibe. I then thought that doing letter boards above each of their beds might look cute, the cutest Shop Words & Co. sent us two Rambler boards. The rug is from Lorena Canals and is washable...yes you heard me right, WASHABLE! Letterboards - c/o Words & Co.